QATestLab, an independent provider of QA and testing services, together with partners presented the research Future of Mobile Test Automation based on the expertise and opinions of the leading representatives of QA companies and manufacturers of test automation solutions. The respondents are Antony Edwards, COO at EggPlant (Great Britain), Costin Secareanu, Senior QA Automation Consultant at IOVIO (The Netherlands), Ron Werner, Team Lead Mobile Testing at QualityMinds (Germany), Matt Robson, Executive Director at TSG (Great Britain), Marcel Diepenbroek, Director at InnSpire (The Netherlands), and Duncan Brigginshaw, Co-Founder and Technical Director at Odin Technology Ltd (Great Britain). A dynamic marketplace requires the delivery of high-quality solutions and code with speed and agility. Respectively, shortening of the release cycle reduces testing lifecycle. To deal with the pressure, organizations are adopting a test automation strategy for mobile testing. However, the current state of mobile test automation is considered to be ambiguous. The research provides an overview of mobile test automation as emerging segment of test automation market. It explores the specifics of current solutions for mobile automation in accordance with the trends of mobile software development. It also reviews the challenges of mobile test automation and touches on the perspectives of its development. 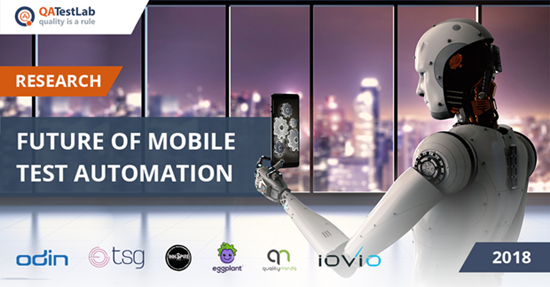 “All the challenges of mobile automation form a significant driver for organizations to introduce test automation, to provide continuing escalation of test cost. Test Automation solutions have to focus on ‘build once, execute many’ principle, with particular consideration on how to correctly handle the expected results” says Matt Robson, Executive Director at TSG. The research Future of Mobile Test Automation can be downloaded here.